Results, News, Articles, and More! Christopher was one of only five drivers chosen to participate in the Destination: Race Day Young Hawks Program. Destination: Race Day is an independent website that reports news and statistics for small and medium size race teams and their drivers, as well as, new and up and coming drivers. DRD also posts NASCAR Nationwide Series, NASCAR Camping World Truck Series, and ARCA Racing Series race results. The goal of the DRD Young Hawks Program is to help Publicize 2013 racing statistics and future aspirations for a few select drivers age 17 and under. DRD helps the young driver's get noticed by teams, driver development programs, and sponsors by reporting the driver's statistics on the DRD website. Christopher is proud that he was chosen to be one of the DRD Young Hawks, and he hopes that this exposure will help him obtain sponsorship for 2013 and beyond. To view the Destination Raceday's website click on the following link www.destinationraceday.com. To like them on Face Book click here. To follow them on Twitter go to @draceday. Christopher practiced his Legend at Houston Motorsports Park and ran the fastest time he has ever run at this awesome facility. His times are now on par with the fastest Legend driver's Houston has played host to inthe past. 2013 here we come. Christopher swept Texas Motor Speedway's NASCAR race weekend in the Young Lions class. He raced two races on Lil' Texas, 11-2-2012 and 11-3-2012, starting at the rear of each heat and feature and won every race. What an awesome weekend and a good sign for 2013 racing. Christopher was interviewed for an article for the web-site "In Wheel Time". 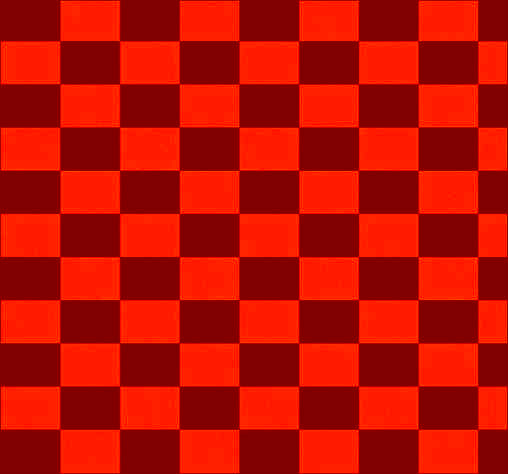 Check it out at http://inwheeltime.com/tag/go-cart-racing/ . Christopher raced his fourth Legend car race ever at Sunny South Raceway in Grandbay, Al on March 31st. He had a blast learning the very fast high banked quarter mile. Only being his fourth race in the Beast (the nickname for his very black Legend), and at a track he had never raced on, he decided to take it easy and just get the seat time and not get in the way of any of the local drivers. The feature was an extremly long race with one red flag after another and multiple wrecks. By the end of the race Christopher was getting very comfortable with the track and was very racy with precision restarts and awesome side by side racing. His car was fast, and he was able to pass with no problem, and in the true form of Christopher he avoided all the wrecks with extreme skill and timing. He ended up third in the Legends Young Lions class and was very proud of his finish having never raced on the track before in any kind of race car. His goal in 2012 is to get as much seat time as possible, and at as many tracks as possible, so that when 2013 comes around he'll be ready to make a run at a championship. Christopher drove his first Legends Young Lions races at Texas Motor Speedway March 23, 24th, and 25th, 2012. He was the youngest driver in the Semi-Pro/Young Lion combined race. In his first race he decided to hang back on the start and take it easy so he wouldn't get in the way of the more experienced racers. However, about a quarter of the way through the race he realized that his car was racey and really sticking well to the track so he decided to push it a little more. By the time his first race ended he was 6th overall (out of a field of twelve) in the combined Semi-Pro/Young Lion class and was 3rd in Young Lions (out of a field of seven). His second race on Saturday proved to be even better because he felt a lot more confident. He finished 7th out of 11 in the Semi-Pro/Young Lion class and again 3rd in the Young Lions class (out of seven). On Sunday, March 25th, with his confidence high, Christopher raced hard and was beat up pretty good with both his left front and left rear fenders being torn off. He finished 8th overall out of 15 Semi-Pros and Young lions and again 3rd in his class of Young Lions (out of eight drivers). All in all his first races in his Legend went great. Team Hogan Racing is very proud of Christopher's success at racing his Legend for the first time at the age of twelve. He exceeded all the expectations and goals set for his first Legend races by the team. Being Christopher, he is an over acheiver and showed it again in his racing at a very tough track in the Legend we lovingly call the Beast. Christopher climbed into a Legend for the first time today to get ready for the 2012 season. We believe in lots of practice before a first race in a new series so over the next year he will practice the Legend while he continues to race his Bandolero. Christopher did an incredible job learning to shift for the first time. Christopher was able to get in the Legend and within a few tries was able to take off without stalling thanks to Jason Morman, the 2010 NASCAR Pro Modified Champion at Houston Motorsports Park who explained to Christopher how to work the clutch and throttle to get him moving. Once Christopher was able to take off for the first time he never stalled the Legend after that and he took the car out on the track and worked his way through the gears. He has a full year to get comfortable with the car and learn to race it. As a Team we were happy to get him in the car and start practicing for 2012 because we are now a head of schedule. Team Hogan racing is getting ready for next race season and Christopher making an attempt at the 2011 Bandolero Bandit National Championship. So far on the schedule are 41 races for 2011, and that is not including any of the races we will try to make out to Charlotte and Atlanta Motorspeedway. We will be very busy traveling all over the state of Texas as well as the East Coast in 2011 for Christopher's racing. If you know of anyone who would love to sponsor a really cute eleven year old race car driver for 2011 please send them our way. Well the race season has started once again. Last weekend was Christopher's first race of the Houston Motorsports Park racing season. He started off 2010 with a bang by coming in first place in the Bandits class at HMP. After winning the 2009 Bandolero Bandits Championship we were hoping that the 2010 would go as well and he is off to a good start. Team Hogan Racing plans on racing at Houston Motorsports Park, Thunder Hill Raceway and Texas Motorspeedway in 2010. We also plan on going to Monroe Motor Speedway if they are able to stay open. On August 21st, TMS is hosting the Bandolero Nationals on the Quarter mile track and Christopher plans on being there. Kaitlyn will race her first Legends race on June 12th, 2010. HMP has a limited Legends schedule but their plans are to have a full schedule of Legend races in 2011. Kaitlyn is looking forward to driving her Legend even on a limited basis. She plans to continue helping HMP tech with the USLegends program for 2010. Team Hogan racing has been busy racing non-stop at Texas Motor Speedway and Houston Motorsports Park over the last few months. Christopher has raced a total of 56 races, without a break, since last December. Last weekend the team finally took a weekend off to take a vacation in Savannah, Ga., but in the true spirit of obsessed racers we ended up going to watch the Bandolero Nationals in Atlanta Georgia. Christopher was able to check out the competition that he will be racing against in 2010 when he will make his first attempt at the Nationals. He had a great time watching the races, however he was itching to get in a car and race. He told everyone he met at Atlanta Motor Speedway that he races a Bandolero in Houston and Ft. Worth and he will be racing the Nationals next year. We will do our best to get him to the Nationals in 2010. We are actively looking for sponsorship for Christopher to help met the goal of racing the nationals in 2010, and Christopher plans to run the Summer Shootout in Charlotte if sponsorship can be obtained. 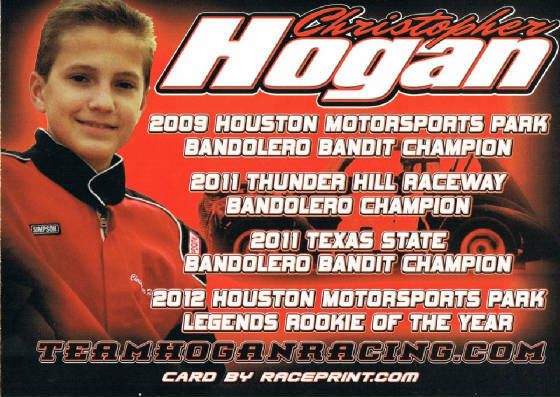 Please contact achogan@teamhoganracing.com if you or anyone you know may be interested in sponsoring Christopher Hogan and his Lil' Red #81 Bandolero. Team Hogan Racing had a great weekend at Lil Texas Motor Speedway in Ft. Worth racing during the NASCAR weekend. Christopher ran a fever all weekend and did not feel the greatest, but insisted on racing his little red Bandolero to get the track time. Christopher is continuing to learn the great little short track in Ft. Worth and did a great job holding onto an ill handling car all weekend. His crew, Dad and Mom, just couldn't get the setup right all weekend except fo the Heat Race on Sunday. He had a good car during Sunday's Heat Race and finish third, but once again Dad and Mom made an incorrect adjustment and the car was extremely tight for the Main event. To make matters worse he was hit by a passing car which knocked the tow right out of the left front and really slowed down his progress. Subsequently, he ended up eighth in Sunday's Main Event. However, he enjoyed himself tremendously and is just happy he got to race in spite of feeling so crummy. Christopher ran his first road course race in four years of racing last weekend, January 10th and 11th, at the Texas Motor Speedway Road Course. Much to the surprise of his Crew Chief Dad and Team Manager Mom, Christopher was fast and had a great set up right off the trailer. He was the fourth fastest car on the track in the second practice of the day and had no problems what so ever handling Lil' Red through the right and left hand turns. Christopher really enjoyed determining when he needed to lift on the throttle, use his brake, and when he needed to gun the car down the straight aways. After the first race, Christopher popped out of his car exclaiming that he loved road course racing and wondered why Bandos don't race more road courses as part of their race schedule. On Saturday, January 10th, Christopher placed sixth out of thirteen drivers in his main race (the race included the Young Guns as well as the Bandits) and 4th in the Bandits class. On Sunday, January 11th, Christopher placed 8th in the main race on and 6th in the Bandit class. Sunday was a more challenging day for Christopher who admitted he was really tired and kept making driver errors. He also admitted he really needed to use the restroom and just wanted to finish the race so he could make a bee line for the bathroom. He came away laughing and stating it was the best weekend ever (he says that every weekend he races)!!!!!! Christopher raced two Monster Jam exhibition races on Saturday January 3rd at Reliant Stadium as part of the Houston Monster Jam pre-show activities. Christopher has raced the Monster Jam pre-show exhibition races three other times in his racing career, twice were in his Quarter Midget. Christopher handed out 500 autographed pictures to fans during the pit party. In addition, he autographed Monster Jam programs, checkered flags, shirts, and anything else fans asked him to sign. He had a great time taking pictures by Lil' Red with many of the Monster Jam fans. The Monster Jam exhibition is a race in the very loosest sense of the word "race". In true Monster Jam fashion, the cars never got lined up two by two for the start and the flag man threw the green flag whenever he felt like it, and he did the same for the checkered flag (we think the flagman based his flag throwing timing upon what color car he liked best). Subsequently it was mass confusion, however it was only meant to be an exhibition race to entertain the Monster Jam fans and help promote the Bandolero program in Houston. The kids drew for the line up and Christopher started seventh his first race and 5th his second race. The kids only raced six laps and we think (emphasize "think") Christopher got fourth in both races and out of nine cars we felt pretty good with those results. He was one of only two Bandolero Bandits (age 8-11) in the field. The rest of the field was Young Guns (ages 12-16). Subsequently, he beat four other Young Guns. He really enjoyed himself with the fans and says he really loves racing the dirt. I just may have to find him a 600cc Micro to practice on the dirt. Check out this great blog by Jason "Stix" Buckley from LegendsNation.com. The article talks about parents who are way overzealous about their kids racing. We have personally experienced this type of behaviour in Quarter Midgets as well as Bandoleros. Why can't parents just let their kids have fun? Aaron and I personally believe that at age nine Christopher should be having a blast racing and not worrying about making it as a professional race car driver. Christopher loves to race and we certainly don't want to take that love away from him by being overzealous. A win is nice, but having fun, good sportsmanship, and learning to race with skill is what we want for Christopher right now at age nine. We personally feel that as long as he loves what he is doing, and has a blast doing it, he will reach his goal of being a professional race car driver one day.